California Lawmakers Prepare For Trump, Hire Ex-Attorney General Eric Holder : The Two-Way The Democratic-dominated Legislature adds legal firepower as it anticipates a court battle with the new Trump administration over issues such as climate change and immigration. Former Attorney General Eric Holder testifies on Capitol Hill in Washington in June 2012. Holder, now in private practice, has signed on to represent the California Legislature as outside legal counsel. Democratic leaders of the California Legislature signaled their intention Wednesday to fight any challenges to state policies by the incoming administration of Donald Trump by hiring as outside legal counsel former Attorney General Eric Holder. The announcement came in a joint statement issued by California Senate President Pro Tem Kevin de Leon and Assembly Speaker Anthony Rendon. "With the upcoming change in administrations, we expect that there will be extraordinary challenges for California in the uncertain times ahead," said the lawmakers. 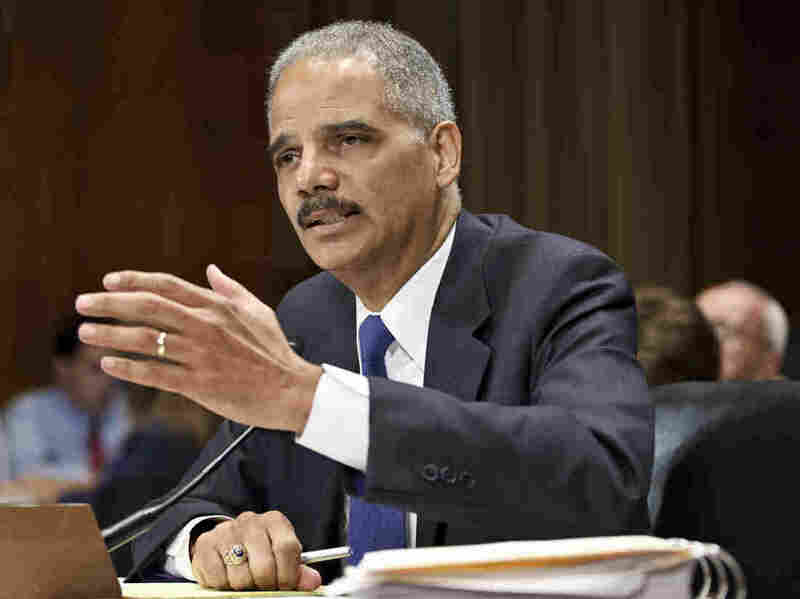 Holder will assist Gov. Jerry Brown, yet-to-be-confirmed Attorney General Javier Becerra and the Legislature "to protect California's economy and our sensible policies on climate change, health care, civil rights and immigration. This is a critical moment in the history of our nation. We have an obligation to defend the people who elected us and the policies and diversity that make California an example of what truly makes our nation great." The move comes amid escalating rhetoric from California leaders, all Democrats, since the election in which Trump lost the state by more than 4 million votes. Last month Rendon called the Trump administration a "major existential threat." Days later, Brown delivered a full-throated warning that California has no intention of reversing its climate change policies. "We've got the scientists, we've got the lawyers, and we're ready to fight," Brown told a group of scientists in San Francisco. "We're ready to defend. California is no stranger to this fight." Holder was attorney general in the Obama administration from 2009 to 2015. He's currently a partner in the law firm Covington & Burling. According to the Associated Press, the firm will be paid $25,000 a month for three months starting in February. The deal will be renegotiated afterward. But it's not going over well with Republican lawmakers. "The state's incoming attorney general has spent decades in Washington working on federal policies," said Assemblyman Chad Mayes, R-Yucca Valley, in a statement quoted by the Sacramento Bee. "It's not clear why legislative Democrats needed to hire a D.C. insider to litigate the exact same issues." In a statement offered by de Leon's office, Holder said he was honored to help the Legislature "as it considers how to respond to potential changes in federal law that could impact California's residents and policy priorities. I am confident that our expertise across a wide array of federal legal and regulatory issues will be a great resource to the legislature."